Muscle Milk Protein Powder is an excellent source of protein and essential nutrients to help fuel recovery from exercise and help build muscle. This easy-to-mix powder can be added to supplement shakes, smoothies and favorite recipes. Muscle Milk Protein Powders can be used pre-workout, post-workout or as an anytime protein-rich meal option or snack. Muscle Milk Protein Powder provides all 9 essential amino acids, which the body is not able to produce, with an immediate and prolonged protein delivery in the body. Muscle Milk Protein Powder provides high quality proteins that are designed to keep your body in positive protein balance to help promote exercise recovery, provide sustained energy and help build lean muscle. How To Use Muscle Milk Products? Protein packed on-the-go breakfast. Pre-workout fuel. Workout recovery. Convenient meal option. Good for you anytime snack (including night time). On-the-go solution in time crunches. tasting hunger satisfaction. Willpower for better snacking choices. You know your body. You know your body needs protein. You care about what you put in your body, and you make every effort to understand ingredients, benefits and functionality. You recognize that protein isn’t just about muscles or intense workouts or something you only find at the gym. Protein is fundamental to help you live and perform better. We get it. We don’t want to just provide products. We want to provide products that amplify your lifestyle and help you become stronger everyday. Our protein is expertly formulated with high quality ingredients and key nutrients. All MUSCLE MILK powder products are NSF Certified for sport ensuring that they are safe and free of banned substances. We pioneered great tasting protein, and continue to offer a vast array of flavors. Need a cookie kick? Grab a cookies and cream flavored Muscle Milk shake. Craving chocolate? Of course we have that. We offer nearly 50 different flavors across our shakes and powders. We helped build the protein category and continue to remain a leader. We’re a trusted partner with dozens of collegiate athletic programs, world-class professional athletes and elite training facilities. We work closely with sports scientists, sports dietitians, strength coaches and other experts to ensure we’re producing the highest quality products. Whether you’re a high school athlete trying to get to the next level or a mother of two trying to get to yoga class, we offer a range of protein products that feature the nutrients your active lifestyle demands. Do Muscle Milk Products Contain Milk Or Dairy? The term ‘dairy’ on a food product, pertains to foods such as milk, cream, half and half, yogurt, ice cream, and custards. Since dairy is a regulated term, to qualify as a dairy product you need to contain fluid ‘milk’ or certain ‘dairy’ ingredients conforming to the federal standard of identity for ‘milk’ or ‘dairy’. 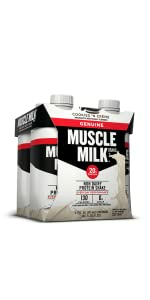 Muscle Milk Ready to Drink Protein Shakes are derived from milk (calcium caseinate, sodium caseinate, milk protein isolate, milk protein concentrate and/or whey protein concentrate, depending on product.) Since these ingredients are more refined than milk, (reduced lactose, cholesterol and fat content), it is not the same thing as milk. So technically speaking, Muscle Milk Protein Shakes are ‘non-dairy’ and are labeled on the bottle as such. An example of another ‘non-dairy’ product derived from milk ingredients is non-dairy creamers. Muscle Milk Ready to Drink Protein Shakes do contain milk proteins and therefore should not be consumed by persons with milk allergies. 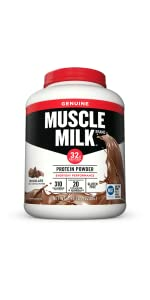 Are The Proteins In Muscle Milk Ready To Drink Shakes And Powders Considered To Be High Quality? Yes. The gold standard for measuring the quality of a protein present in a food or drink is called the Protein Digestibility Amino Acid Score (PDCAAS). The quality of the whole food protein is based on the food’s essential amino acid content based on human needs, and its digestibility (ability to supply amino acids). A PDCAAS of 1.0 is the highest score a food protein can receive. This means that the protein food contains 100% of the amino acids in the right amounts needed by the body. Muscle Milk Protein Powders and Muscle Milk Ready to Drink Shakes receive the highest PDCAAS Score of 1.0. I Have Lactose Issues, Are Muscle Milk Ready To Drink Shakes And Powders For Me? Muscle Milk Ready to Drink Shakes and Powders are suitable for most individuals that are sensitive to lactose. There are some Muscle Milk products that contain more than 1 gram of lactose per labeled serving, so if you are highly sensitive to lactose, you may wish to avoid these products: Muscle Milk Smoothie Yogurt Protein Shakes – 3 grams lactose, Muscle Milk Organic Protein Shakes – 1.1 grams lactose, Muscle Milk 100% Whey Protein Powder – 1.5 g lactose, Muscle Milk Performance Whey Protein Powder – 3.2 g lactose. Are Muscle Milk Ready To Drink Shakes And Powders Gluten Free? Yes. All Muscle Milk Ready to Drink Shakes are gluten free. Are Muscle Milk Ready To Drink Shakes And Powders Kosher? All Muscle Milk Ready to Drink Shakes are Kosher except Muscle Milk Smoothie Yogurt Protein Shakes. The only Muscle Milk Powders that are Kosher are Muscle Milk 100% Whey, Vanilla and Chocolate flavors. Are Muscle Milk Ready To Drink Shakes And Powders OK For Teens To Consume? Muscle Milk Ready to Drink Shakes are a nourishing and wholesome food product that can be utilized to help meet the fitness and health goals for many individuals. The Muscle Milk brand offers a variety of great tasting products that fit individual needs and preferences. They can be especially helpful in providing high quality protein options that are gluten free and suitable for most individuals that are lactose intolerant. Muscle Milk Ready to Drink Shakes and Powders are currently being utilized by more than 200 high school athletic programs and more than 400 collegiate programs, in addition to professional teams and athletes. All Muscle Milk Powders are tested for banned substances and nutrient content and are NSF Certified for Sport ensuring their safety and freedom of banned substances. 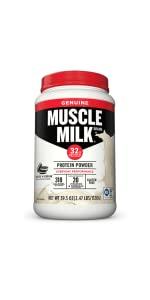 Can I Use Muscle Milk Ready To Drink Shakes Or Powders As A Meal Replacement? Many people use Muscle Milk Ready to Drink Shakes and Powders as a meal replacement or snack between meals. The ready-to-drink products are especially convenient to use as a meal replacement or snack when you are on-the-go. Muscle Milk Ready to Drink Shakes should always be used in conjunction with whole foods and adequate hydration, and never as a sole source of nutrition. When Is The Best Time To Drink A Muscle Milk Ready To Drink Shake Or Consume A Muscle Milk Powder? If you are physically active, the best time to drink a Muscle Milk Ready to Drink Shake or Powder drink is after your workout. This is because research suggests that high-quality, dietary protein supports muscle recovery and growth, and this impact is enhanced when protein is consumed shortly after exercise. Muscle Milk Ready to Drink Shakes or Powders may also be consumed before exercise, as a snack or meal option, or prior to bed time. If you are taking a break from the gym, Muscle Milk Protein Shakes and Powders can be used any time of day to add high quality protein to your diet. Why Do I Need Protein If I Don’t Work Out? Protein you eat breaks down into amino acids in the body, which support muscle growth, repair and maintenance. Complete proteins contain all the essential amino acids required by humans in the appropriate ratios. Protein is also important in numerous processes in the body including hormone function, bone health and nutrient transport. Protein compounds in the body are constantly changing, breaking down and rebuilding with new amino acids from the foods you eat. Consuming complete proteins (high-quality protein) at each meal supports the rebuilding of proteins required for healthy muscle and bones. Consuming both fast and slow release proteins help keep your body in positive protein balance. Protein helps fill you up, and may help you maintain a healthy body weight, especially in conjunction with exercise. 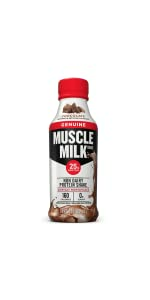 I Do Not Want To Get Big Muscles, Is a Muscle Milk Ready To Drink Protein Shake Right For Me? Protein after exercise aids in recovery and may help reduce muscle soreness and helps build lean muscle. 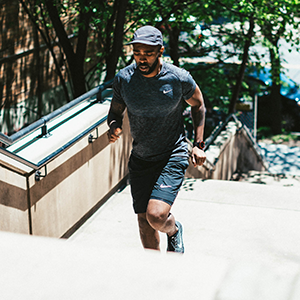 Exercise and physiological stress can speed up the process of proteins breaking down. Consuming a slow releasing casein protein such as that found in Muscle Milk Ready to Drink Shake prior to bedtime helps the body stay in positive protein balance while sleeping, which may support post-exercise recovery and muscle growth. 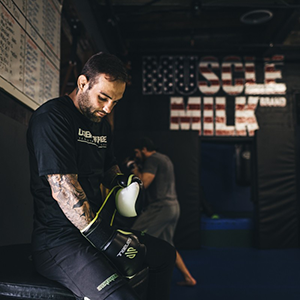 The essential amino acid leucine, a component of the proteins found in Muscle Milk Ready to Drink Shake, is a key driver in kicking off the muscle growth and repair process.